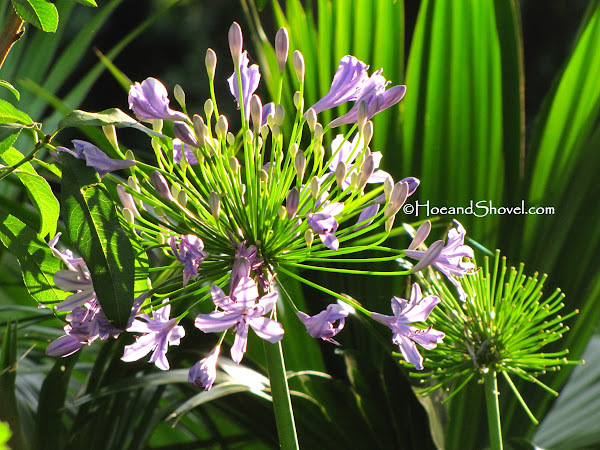 Every year I find ways to add more and more Agapanthus orientalis to my garden. Either by dividing the plants already growing or by purchasing additional ones. Did you know they are part of the Amaryllis family? 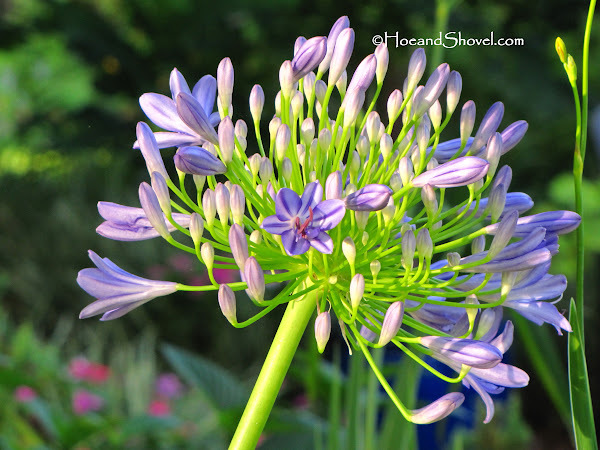 The most common name for them is African Lily or Lily of the Nile. Some folks say they are blue. But to me they appear more lavender or periwinkle. Especially when compared to a true blue flower like plumbago. These herbaceous perennials are extremely Florida-Friendly in this zone (9). That means they perform well in our heat and humidity as well as sustaining frost and freezing temperatures in winter. Once they are established they can even tolerate drought conditions. Because I've planted them in numerous locations throughout the garden mine start blooming in May and some of my plants are still throwing up new buds now at the end of June. I find they are healthiest when planted in partial sun. They can take a good amount of sun but the foliage seems to stress a little bit in Florida's full sun. That's just my observation as I've tried to notice them growing around town in various conditions. 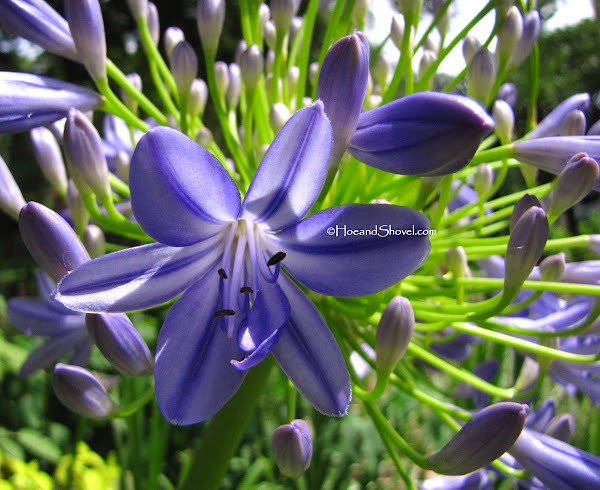 Undoubtedly, African lily is one of my favorites in the spring/summer garden for their remarkably lovely flowers on 3-4 foot scapes. And, being a foliage fan, I have to say I'm equally fond of their strappy, evergreen leaves that sail through winter unfazed. The contrast of the bright green stems against the purple trumpeted flowers is another feature I admire. 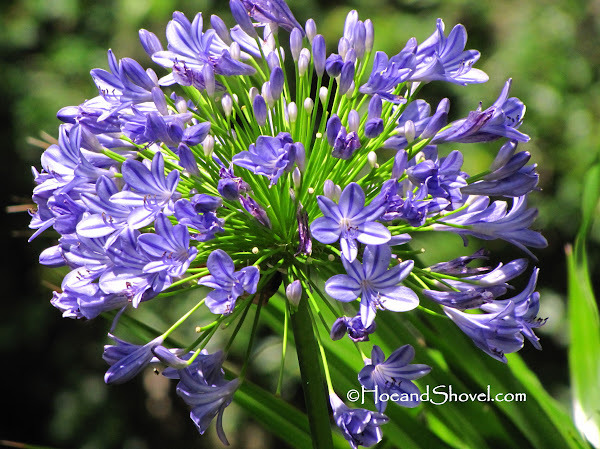 Agapanthus add bright and cheery beauty to the garden in every stage of growth. Oh great! Just last night I was thinking that I really do have to quit buying plants.....now you post all these beautiful pics of Agapanthus. I really do need to find the room (will have to quietly enlarge on of my beds)for one agapanthus. Problem is that then I will have to find room for another one because they are so beautiful. Too funny. I keep saying I need to "quit buying plants". And just when I think I'm finished for this season~~ there goes my brain dreaming up some other idea to tweak or create. :-) Without going to the trouble of enlarging a bed you could easily put one or two in a container plant. I am with SiestaSister...I saw these in your posts and I now have them in my garden. Agapanthus have brought such joy to me this season. I am now left with the green form left after the blooms. They are also quite unique. I had this many years ago. It was in bloom when I bought it, and never bloomed again and died away. I was more of a novice back then. It is a lovely bloomer that's for sure. These are one of my favs, mostly because they are my favorite color, periwinkle. Yours are gorgeous! I think I need to move mine to a more shaded location and see if they are happier. Thanks for the idea! Fantastic photos the way the sunshine is really showing off their colour - thanks! Thanks for you tips-I have been thinking about ordering some of these bulbs. The color of the blooms is just lovely. It is a lucky day when I see one of mine actually flowering. they do not like the winters and take forever to recover. Beautiful shots! I have 2 of these. One lavender/blue & the other white. They are in pots & have not bloomed since the first yr. I had them. I've moved the pots in order to see if that has anything to do with blooming. I hope they bloom as I really like it. I leave the spent flowers dancing in the air also. I even like them when they turn to seed. So happy to hear you got some rain... we have finally been getting some these last couple of days. Such a relief! Some people say they do fine in lots of sun. I've never seen any that the foliage looks as healthy in those conditions. Fortunately they move/establish easily. I dialed down the exposure compensation and photographed them in the morning sun and some in middle of the day. I think it shows off their color, too. I would be interested to hear how they do started from just the rhizome. Unlike here where the foliage perks up in winter and becomes one of my sturdy cold hardy faves. Maybe you could try them in a container and move them into your greenhouse? Hmmmm... I really want to try some in containers to see how they compare to the in-ground plants. I've seen them doing very well in pots. Yes, Aggies are beauties, for sure. Great photos! Love the color of these lilies. They are hard to notice as I drive around town. I have ZERO room for any new plants in the garden right now, but if I can whittle out a space in the future these would be high on my list. 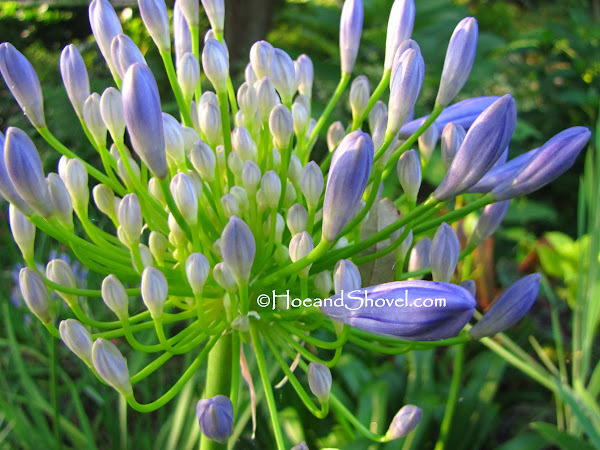 I just purchased an agapanthus with darker blue blooms that I'm excited to see it flower. We have these growing in my church garden, and they do seem to do better in partial sun. I was debating where to plant mine at home, so thank you for your information about their sun/shade preference. The tag on the "Texas grown" plant I purchased did say "full sun," but from my experience at my church garden, I was suspect. If they prefer a little relief in Florida, they will definitely need it in Texas. Had to laugh at SiestaSister's comment. Just the other day I was commenting to my husband that I have a sickness -- I cannot stop buying plants! It is an unusual habit for our southern plants with the large flowering head of multiple flowers. I think your Michigan has many beauties to choose along this vein. Have never heard them referred to as Aggies... but I like it and I'm adopting it... shall think of you every time. I, too, love agapanthus. They are so easy care and depending on the variety they are more blue or more periwinkle. I like the white mixed in as contrast. Storm Cloud is one of my favorites! 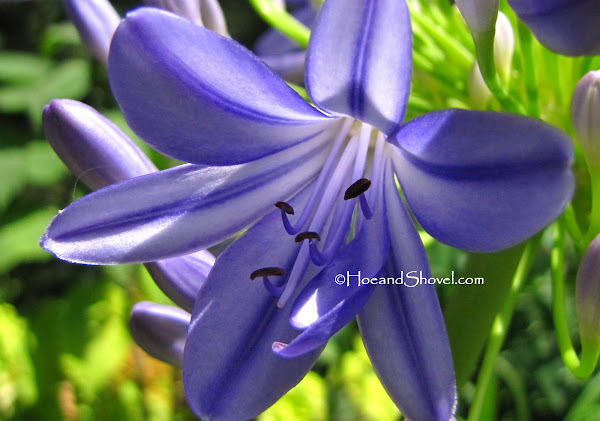 Having multiple agapanthas blooming must be a stunning sight. I definitely need to move the one I have in full sun. The leaves are all bleached out. But, it has bloomed two stalks of beauty. I'm glad to hear you got some rain. We finally got some this past weekend and what a relief for the garden. 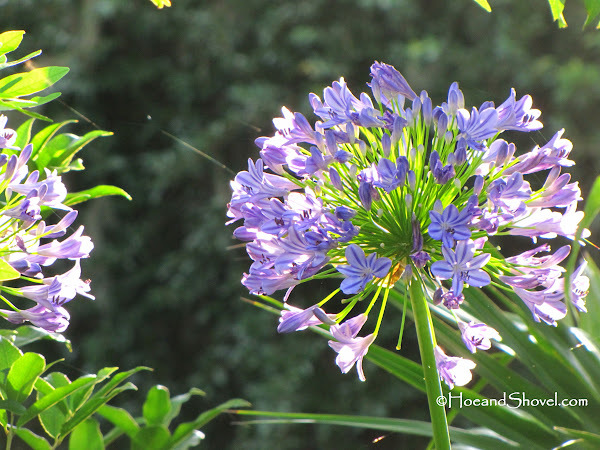 From what I've seen it seems CA is a great environment for Agapanthus. The darker purple one doesn't work as well for me. Not sure the reason. I stick with the periwinkles and once in a while a white one gets in the mix by mistake.